This was our third encounter in this area. 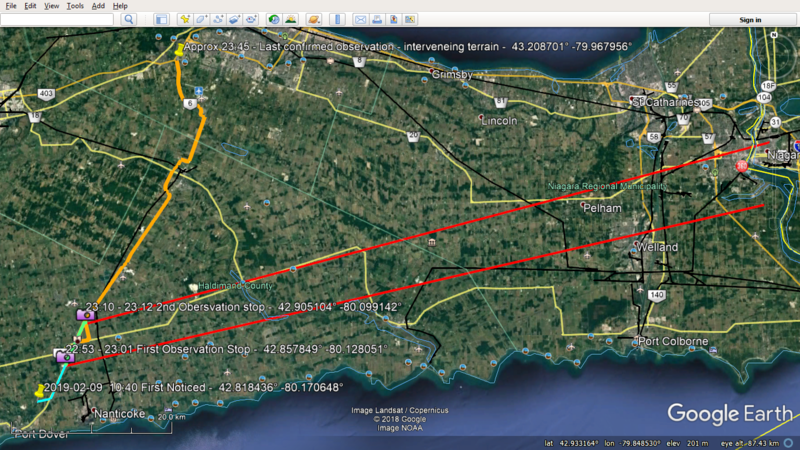 we were returning to the toronto area from port dover heading east on st johns rd. my wife noticed a scintillating star (22:40) ahead which was the same as our first encounter. after turning north on hwy 6, i started looking for a good place to get off the main road and she started unpacking my nikon dslr. after shooting a few shots directly out my driver side window at right angle to the road (42.857849 n -80.128051 e, bearing 77 degrees east, 20 degrees elevation 22:53-23:01 - dsc0475.Jpg – dsc0488.Jpg and dsc_0487.Mov) and not being able to get a clear shot i switched to video. the object was cycling through the entire spectrum four times a second (established by image dcs_0478.Jpg, which was an accidental shot while still lining up the object, the motion in the shot is from the camera moving, but the shutter speed was ½ second and the entire colour spectrum is cycled twice). at the point i was sure it wasn’t a star or any natural object i had seen before, nor was it the iss or a satellite. it didn’t have the lighting for a licensed aircraft. i thought it might be a drone until it had been visible for 30 minutes, i haven’t known any drones with the ability to stay aloft that long. we then packed up and travelled down the highway a few kilometers to another street in an attempt to triangulate a location. at that location we took some more video and photos (42.905104 n -80.099142 e, bearing 75 degrees east, 20 degrees elevation 23:10-23:12 - dsc0489.Jpg – dsc0492.Jpg and dsc_0491.Mov) which turned out the same. we packed up again and headed out hoping to see some noticeable change in the bearing. while driving my wife attempted to get some photos with my camera while i was driving (dsc0492.Jpg – dsc0503.Jpg) with varying degrees of success. she also took some photos at the observation stops over my shoulder (jarvis1-jarvis3). we finally lost sight of the object as we merged onto the hwy403 as we entered hamilton and came down the escarpment. we may have caught sight of the object in the predicted location according o my in-dash navigation system, but as we hadn’t had los through hamilton, i’m not willing to guarantee that it is the same object. if it was, we still had sight of the object when we reached our destination at 01:00 in brampton and lost sight behind buildings. at all times the navigation system showed the object as being east and we could see it at 20 degrees elevation. at no point were we able to identify the object. the colour changes reminded me of old commodore 64 programs that would cycle through the colour palette to create a flashing sprite. i still wonder if an object like this were seen 2000 years ago if it could have been the star of bethlehem and wondered how long it could keep the same position relative to the ground. even the stars had shifted close to 20 degrees from the earths rotation over the entire trip. some of the images when image filters are used appear to show faint ghost copies of the object. we’re planning a follow-up trip for a week this summer in the same area to see if we can collect more data.